We have seen them hog the top headlines in newspapers, watched them on television and seen their videos and read about them on the internet. From calling for an uprising, to being a hated figure for waging war against the state; from being lauded for the phenomenal development of a state, to taking on the government, these personalities -- mainly from India's polity -- have in some way or the other defined this year. 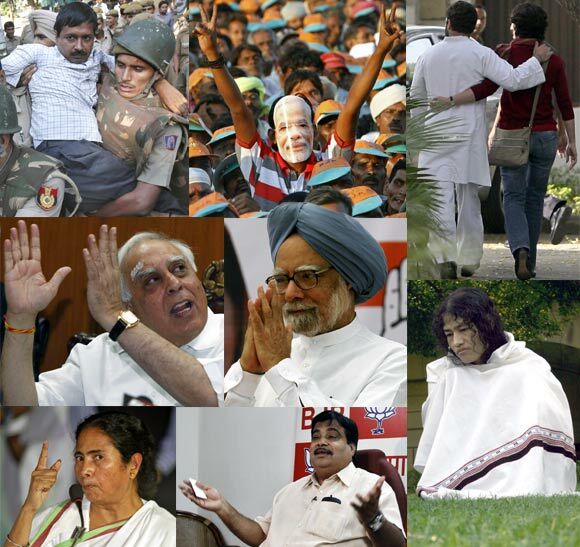 Click NEXT to go through our list of this year's Top Newsmakers. A crucial member of Team Anna, Arvind Kejriwal was one of the brains behind the India Against Corruption campaign that saw a massive sea of support from all across the country. After a roller-coaster ride of 18 months in which social activist Anna Hazare and many high profile personalities came together to run a high-steam anti-graft movement, the group led by Hazare had acrimonious discussions with Kejriwal and his supporters, on the issue of forming a political party. Team Anna suffered a vertical split with Anna Hazare and some top activists choosing to part ways with the Arvind Kejriwal-led group. 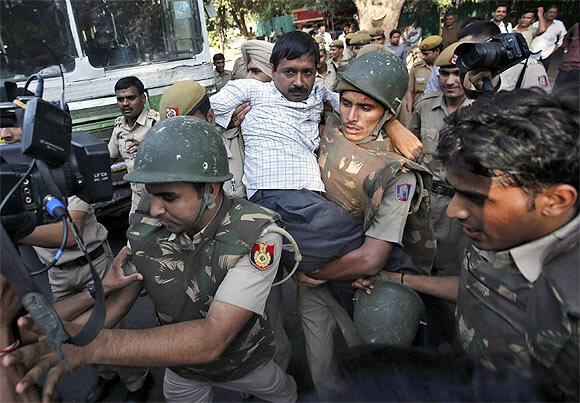 Kejriwal, in November 2012, launched the Aam Aadmi Party, and since then has made several exposes and accusations against powerful and influential political leaders, industries and personalities. Beating all odds Gujarat Chief Minister Narendra Modi led the Bharatiya Janata Party to a decisive win in Gujarat for a third time in a row. 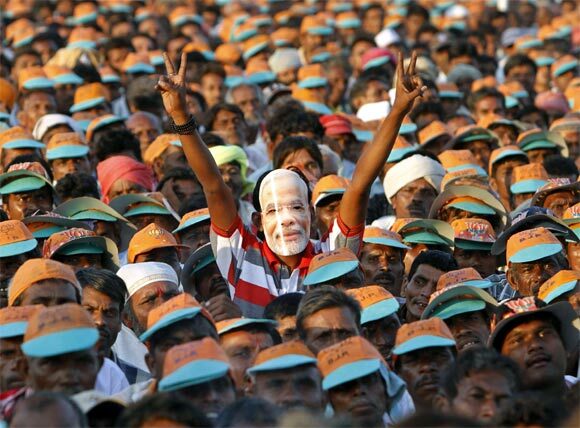 Proving his critics wrong, Narendra Modi succeeded in emerging as a mass leader even amongst the Muslim community in Gujarat, a state that witnessed communal violence in 2002. In the late 2011-early 2012 Narandra Modi underwent a series of fasts as part of the Sadbhavna Mission to strengthen the atmosphere of peace, unity and harmony in the state. Narendra Modi became the first Indian politician to interact with netizens through live chat on the Internet. He went on Google Hangout, used 3D technology and spent millions of rupees to project him as a mass leader. "If Murdoch can be probed, why not India Today?" 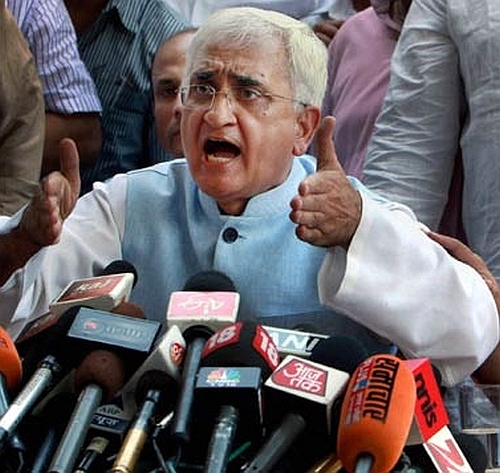 asked Salman Khurshid as he parried a barrage of questions over alleged financial malpractices in the Zakir Hussain Memorial Trust run by him and his wife Louise. The Cabinet minister of the ministry of external affairs lost his cool at the press conference where he yelled at reporters and threatened to leave the press conference without answering questions. Khurshid and anti-corruption crusader Arvind Kejriwal had engaged in an angry verbal joust over the alleged financial malpractices. In October, India Today and Hindi news channel Aaj Tak alleged that the Kurshids had embezzled from the fund. Despite Rahul Gandhi's extensive campaigning in the Uttar Pradesh Assembly election, the Congress party had a disappointing result in the state. 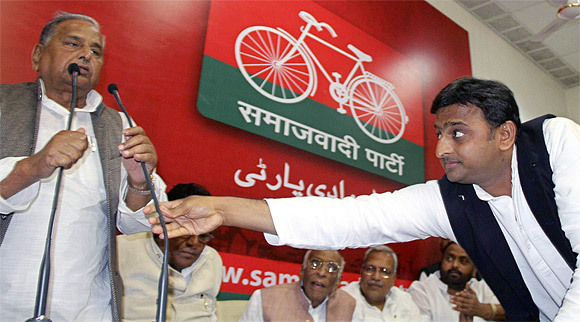 The Samajwadi Party marched ahead in Uttar Pradesh to a clear majority, breaking all previous records and expectations. Though Congress activists defended the result in Uttar Pradesh, the Nehru-Gandhi scion Rahul Gandhi publicly accepted responsibility for the result. Rahul Gandhi was recently nominated to head the Congress party's election coordination panel for the 2014 national elections. Image: Rahul Gandhi walks with his sister Priyanka Gandhi Vadera after speaking to the media in New Delhi. Rahul, tried to project himself as a man of the people as he campaigned tirelessly for the Congress party in Uttar Pradesh. However, the strategy did not work. Uttar Pradesh Chief Minister Akhilesh Yadav led the Samajwadi Party to a stupendous victory in the Uttar Pradesh assembly polls this year. The tech-savvy son of SP patriarch Mulayam Singh Yadav was credited with scripting the party's best poll performance ever. For the youth of Uttar Pradesh, Akhilesh Yadav represented a way forward. Shortly after his election he told media persons that his government would implement all the promises made in the SP manifesto without discrimination of caste and religion. Yet, the decline in Akhilesh Yadav's public image has been sharp. His performance so far has been average. 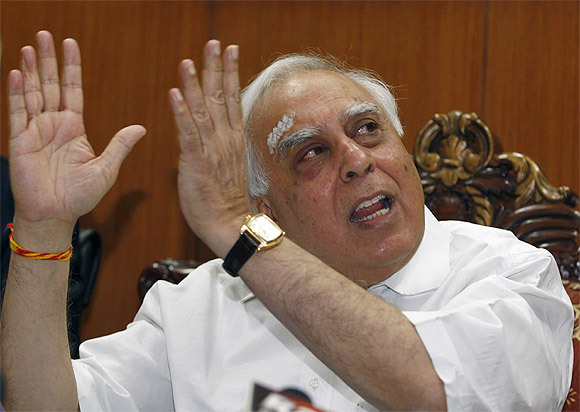 Kapil Sibal stirred up controversy by his comments on regulating internet content. Netizens slammed the minister of communications and information technologyon social networking sites like Facebook, Twitter and Google+. Cyber laws and communications experts feel that Union Minister Kapil Sibal's suggestion to pre-monitor content on social media websites is a flawed argument. On November 30, Sibal's personal website was hacked the hacktivist group 'Anonymous'. The hacking was reportedly in protest of the Section 66A of the Information Technology Act. 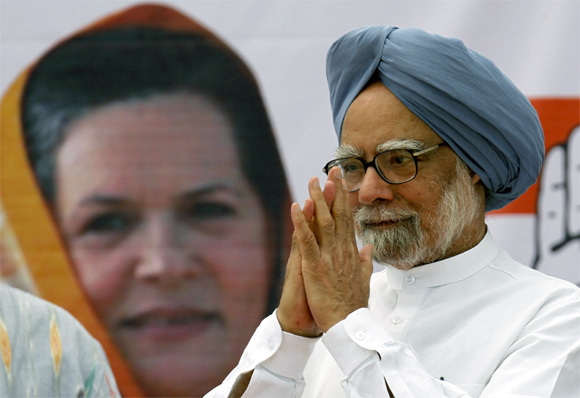 Prime Minister Manmohan Singh has courted controversy by keeping quiet. Even as his government battles a series of scams and corruption scandals, the prime minister has often been attacked for his silence by the media and opposition parties. Prime Minister Manmohan Singh's office got into a wrangle with the Washington Post after the United States daily published a sharply critical article on the PM, the Congress party and India itself. In August a confident prime minister said that it has been his general practice not to respond to motivated criticism directed personally at him. "It has been my general practice not to respond to motivated criticism directed personally at me. My general attitude has been Hazaaron Jawabon Se Acchi Hai Meri Khamoshi, Na Jaane Kitne Sawaalon Ki Aabru Rakhe." 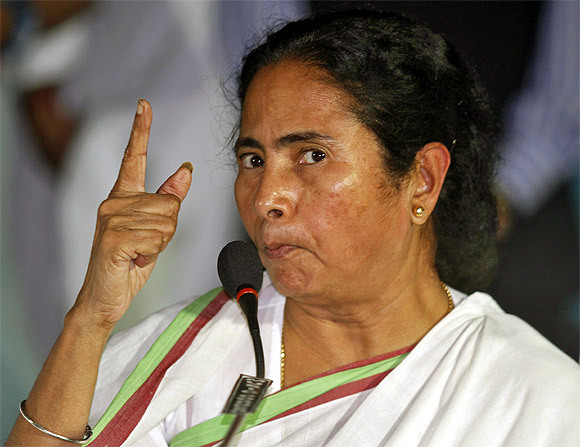 West Bengal Chief Minister Mamata Banerjee lost her cool in a TV show in Kolkata when a Jadavpur University student among the audience asked her about the arrest of Ambikesh Mahapatra, a professor of Jadavpur University, for forwarding a cartoon lampooning her. Are you a Maoist? asked Mamata pointedly to the girl who had asked her the question. The West Bengal chief minister claimed that the Professor was guilty of a 'cyber crime' and what he had circulated was not an innocent cartoon, but a political conspiracy to murder her. In March, Mamata Banerjee forced Dinesh Trivedi to resign as railway minister after he proposed a hike in railway passenger fares, plunging the United Progessive Alliance government in an unusual political crisis. Press Council of India chief Markandey Katju accused Mamata Banerjee of being 'totally dictatorial, intolerant and whimsical', over the arrest of a man, who the CM dubbed as a Maoist at a rally after he asked what steps she was taking to help farmers. Activist turned politician Arvind Kejriwal in his expose had said, "Gadkari has five power producing industries and three sugar industries in Maharashtra. And that is the reason why he did not wish to raise the issue of corruption in irrigation dams. In a short span, he has built a huge business empire with more than 15 companies in sectors, including construction, sugar, distillery, power, coal, agro, etc." The BJP president himself came on camera to dismiss the allegation. His party's senior leaders were huddled together by the Rashtriya Swayamsevak Sangh to reach out to the media and defend him. 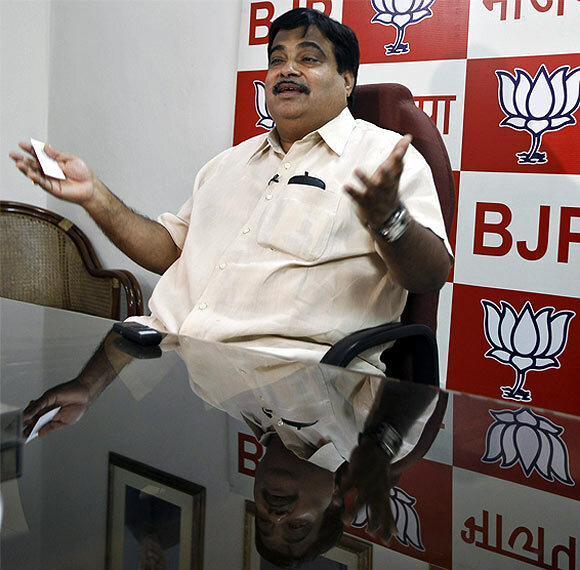 Amid demands from some Bharatiya Janata Party leaders that he should step down in the wake of allegations of dubious fundings of his companies, Nitin Gadkari said he is an "honest man" and ruled out resigning from his post. BJP leaders Ram Jethmalani and Yashwant Sinha had come out in the open to demand that Gadkari should resign as the charges against him were denting the party's fight against corruption in the Congress-led UPA government. 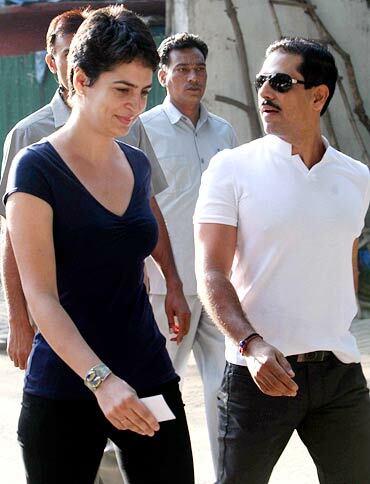 The son-in-law of the first family of the Congress, Robert Vadra, was openly targeted by activist-turned-politician Arvind Kejriwal and his aides, exposing and bringing into the public domain the rise of Robert Vadra ever since he married Priyanka Gandhi. The IAC, in a press conference addressed by Arvind Kejriwal and Prashant Bhushan alleged that Vadra acquired properties worth hundreds of crores from nothing, and questioned the source of these funds. Kejriwal alleged that the Haryana government had given undue benefits to DLF and said the Punjab and Haryana high court had pointed at a 'malafide nexus' between the two. Congress president Sonia Gandhi had made it clear to her party that it must refute allegations of corruption made against her son-in-law. Vadra also drew criticism for his post 'Mango people in banana republic', with India Against Corruption asking him to apologise. Former Karanataka chief minister B S Yeddyurappa, who complained of betrayal by the Bharatiya Janata Party leadership, said, "I am sad, but some things had to be done. I have been made to feel unwanted in my own party." Yeddyurappa quit the BJP to form his own party, the Karnataka Janata Party. 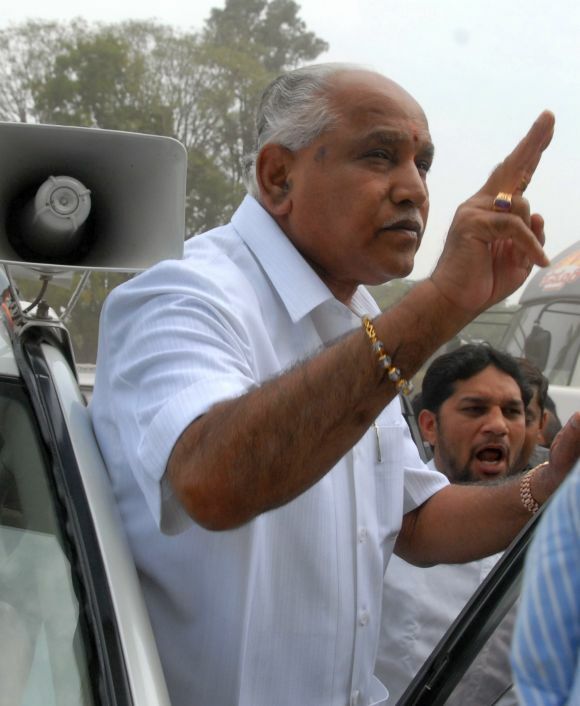 It is alleged that Yeddyurappa, while he was the chief minister of Karnataka, had de-notified land and shown favours for alleged illegal gains. A week after snapping his four decade old association with BJP, former chief minister dubbed it 'a bigger evil' than Congress and Janata Dal-Secular and vowed never to return to his former party. In the last few months of his tenure, he became the first chief of the Army to have approached the Supreme Court against the government on the personal issue of his date of birth. 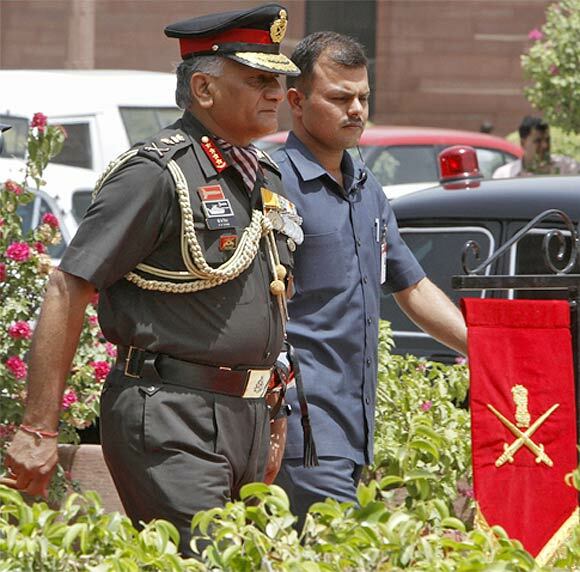 The controversies surrounding V K Singh's much-talked-about tenure as the Chief of Army Staff will surely keep his stint etched in the collective memory of the country for times to come. In a major embarrassment to the Centre, Gen V K Singh dragged the Union defence ministry to the Supreme Court on January 17, 2012 for rejecting his claim on his date of birth. In a writ petition, the general questioned the government's decision to treat his date of birth as May 10, 1950, instead of May 10, 1951 as claimed by him on the basis of his matriculation certificate and other documents. In his petition, Gen Singh has said the matter related to his "honour and integrity" as he headed a force of 13 lakh personnel. In the petition, the army chief argued that the government had chosen to "change" his date of birth after he had spent 36 years in service and promoted throughout the career. However, the defence ministry accepted May 10, 1950, as his DOB, which is on his UPSC entrance form. 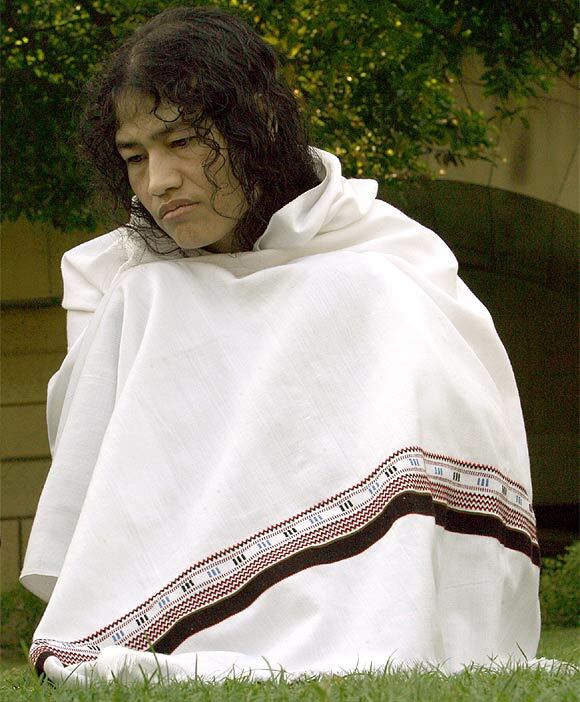 The 'Iron Lady of Manipur' Irom Chanu Sharmila, who has been on a hunger strike since 2000 demanding repeal of Armed Forces Special Power Act, completed 12 years of fast in November. Sharmila, a civil rights activist, began her hunger strike after the death of ten people in an alleged encounter with the Assam Rifles at Malom in Imphal valley on November 2, 2000. Irom Sharmilais in judicial custody where she is forcibly fed through her nose. 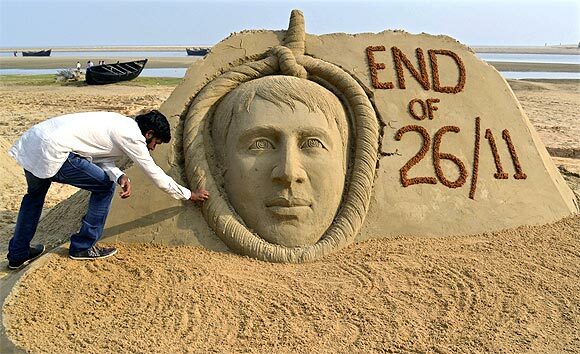 After nearly a four-year-long legal battle, on August 29, the Supreme Court confirmed the death penalty awarded to the LeT operative by the trial court and later upheld by the Bombay high court. Ajmal Amir Kasab, convicted for his role in the 26/11 terrorist attacks in Mumbai, was hanged till death in Pune's Yerwada Jail on November 21. Kasab was very discreetly moved from the Arthur Road jail in Mumbai to the Yerwada jail in Pune a week back. At the Yerwada jail, he was kept in an isolated cell and none of the inmates were aware of such a prisoner being shifted there. Kasab was kept under tight security until the time of his hanging. The 86-year-old cartoonist turned politician, known for his strong views and speaking his mind, sometimes bordering on the offensive, breathed his last at his residence 'Matoshree' in Mumbai on November 17. 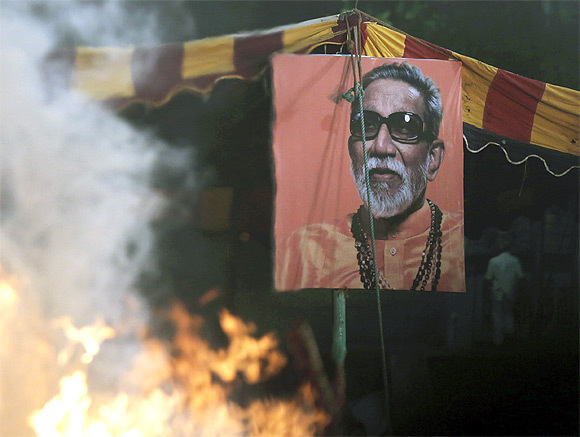 A stream of eminent personalities from politics, films and corporate world reached the historic Shivaji Park ground in Mumbai to attend the last rites of Shiv Sena supremo Bal Thackeray. Police said around two lakh people were travelled with the procession and many others joined it from connecting roads with the sea of humanity stretching for several kilometres. Bal Thackeray was a maverick politician who roused emotions on Marathi pride and catapulted Shiv Sena to power in Maharashtra in the 1990s. After the death of Shiv Sena chief Bal Thackeray, all eyes are on the cousins – Uddhav and Raj Thackeray. The big question being asked is - can Uddhav and Raj get over their enmity and help each other politically?